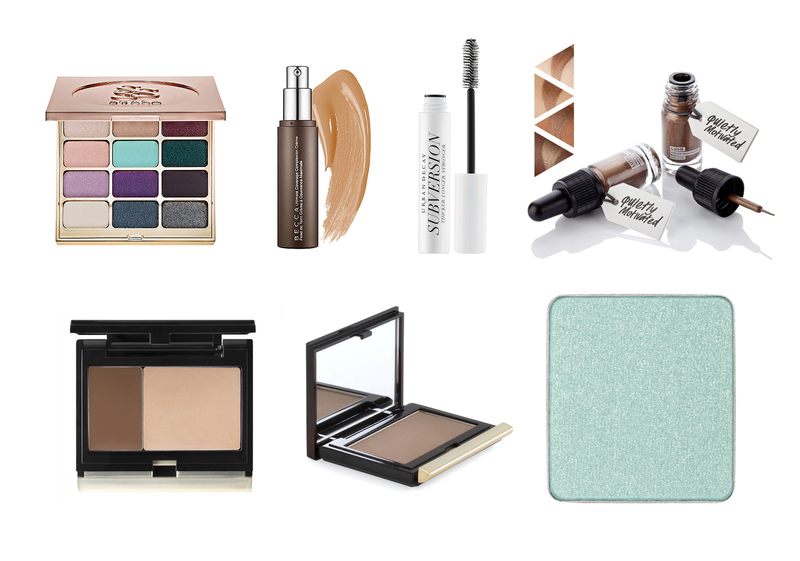 It's been about 2 months since my last Makeup Lust List and it just keeps on growing! There are some new products out, but I'm also looking at some older products that I've heard a lot about that that I really want to get. Let's get started! I'll be going from left to right and the top row first. Stila Eyes Are The Window Shadow Palttes in Body - Stila recently released some new eye shadow palettes and even though all of the others are very beautiful, Body caught my eye because of the non-neutral colors. I especially love the bright aqua blue and the purple and pink shades on the left column. Stila tends to have pretty good sales every once in awhile and so I'm probably going to wait until then to get it. Becca Ultimate Coverage Complexion Crème is supposed to be full coverage foundation that'll cover uneven texture too. I've read some reviews and someone even said it's like Kat Von D's Tattoo Foundation, but without the heavy feeling on the skin. I'm starting to look into more full coverage foundations and this one looks pretty good so far. Urban Decay Subversion Lash Primer was also released along with the Perversion mascara (review here) and when I looked at it in stores, it reminded me of Lancome's lash primer (review here). Since Perversion gave me good results but with disappointing curl hold, I'm interested in the lash primer to see if it'll give me the same volume as the mascara. Lush Liquid Eyeliner in Quietly Motivated caught my eye while I was in Lush recently. Happiness (their copper / rose gold) cream eyeshadow actually caught my eye more, but it made me interested in some of the other cosmetics Lush had to offer. I used to wear a bronze liquid eyeliner from mark. so much but they kept increasing the price and I didn't want to deal with shipping so I stopped using that one. The applicator for Quietly Motivated doesn't look like it'll fit my hand that well, but the color does look really nice. Kevyn Aucoin Sculpting Powder in Medium has been raved about so much and since I'm in such a contouring kick, I've really been eyeing this product. Life's Entropy has a cream contour stick that's a dupe for this color and I kind of want to get the real thing to try out now. Kevyn Aucoin Cream Glow Duo in #4 Candlelight / Sculpting - Speaking of cream products, there's a cream duo version of the above powder. The highlight, Candlelight, is supposed to give a super light from within without being glittery look and I'm always interested in that. The duo is supposed to be pretty small though and so I'm wondering if it's really the price. Either way, I really want it in my collection because I'm a hoarder. Inglot Freedom System Eyeshadow in #24 is a light mint green eyeshadow with a "shine" finish. The Stila palette has a slightly similar color and the Sugarpill Palette I mentioned in my last Lust List also had a similar color. I was super excited to check out the Inglot store near me, but then I realized that it was closed! I really want to swatch this color or the matte version before I get it, but I don't have any colors like this in my collection and I think it'll make a nice pop of color. What have you been lusting after recently? Me too! After I saw Temptalia's review, I was so disappointed but quickly became happy that I was saving money by not buying it. I still want to swatch the colors in stores, but I'm most likely going to skip out on it now. Right after I made this list, I immediately thought of more things I wanted to buy. It's so hard to resist!